Grace is a party girl. To her, everything is a party. If we're having company and Grace sees me getting the plastic cups and paper plates ready for lunch in the back yard, she tells me we're having a party. If she sees me baking a cake, she tells me it's for a birthday party. When I was making a coffee cake to take to our friends' house for dinner, she told me we needed balloons. So, last week, I was so excited to tell her that we were going to a birthday party! Her first non-family, kiddie party! As excited as I was about her going to the party, I was also a bit apprehensive. I imagined her throwing a major temper tantrum and spoiling the party. I imagined Hurricane Grace tearing my friend's house apart. I imagined all sorts of embarrassing scenarios. But aside from not wanting to leave the party when it was time to go, she did great! 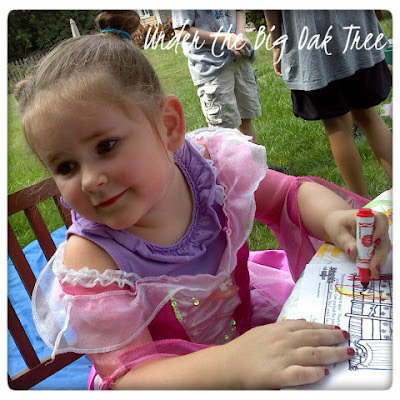 Although, she didn't understand the concept of the scavenger hunt, Grace was busy playing with toys, posing for a few pictures, getting a temporary tattoo, and coloring with the other kids. It was a princess party, so Grace wore her Sleeping Beauty costume and one of the party hat crowns. She had a great time and was much more behaved in public than she normally is at home! Remind me to tell you about the mess she made as we were getting ready to leave for the party that morning....maybe I'll share that next week!